THE “HOOK” – What is it? Keep reading. Newfield is in southwestern Maine. 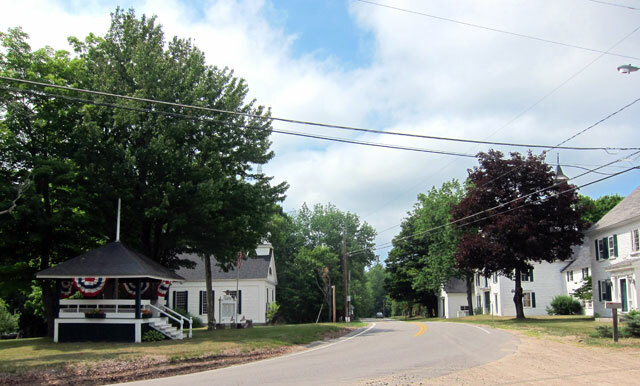 Looking at my New Hampshire map for a backroad to the area I noticed Route 28 crossing US 4 and US 202 outside Concord. Not having been on that route, that was the plan to work north above Lake Winnipesaukee ( (get your map out) I stopped in Alton Bay for lunch – always love visiting there) to Route 16, to head east on Route 25 into Maine. Remember that many roads today bypass the towns they originally bisected (thus Walpole was saved by the Route 12 bypass in 1962). I saw the sign pointing to Pittsfield to the right, and turned. I parked on Main Street, and started going from one historical plaque to another, reading and photographing. The architecture was (is) amazing. Rounding the corner to Carroll Street, I found the Frank Lyman Park with maps and tour booklets (watch out WHS – I have an idea). On the front cover of PITTSFIELD’S HISTORIC TRAIL (just found it on-line – check it out) is printed: “Step back in time to the Nineteenth Century. 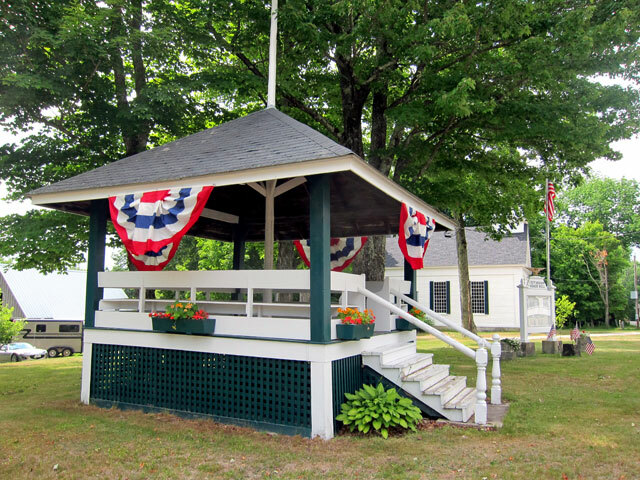 This 1.5 mile walking trail encompasses nearly all of the features found in any New England community over 100 years ago: homes, churches, schools, industrial and commercial buildings as well as dams and bridges. 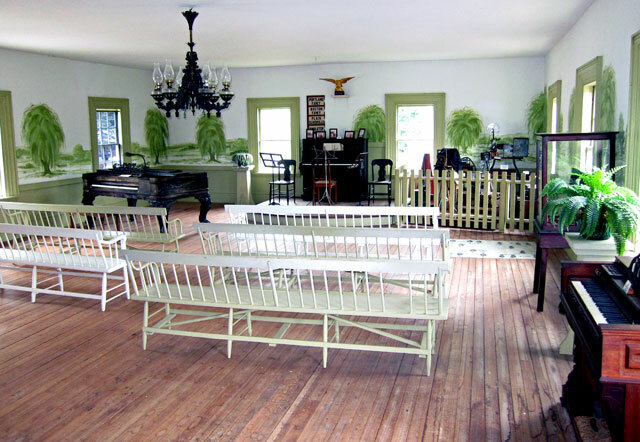 Unlike elsewhere, however, most of the original buildings remain the same as when they were constructed.” I enjoyed touring around, and reading many of the 35 cast aluminum plaques. 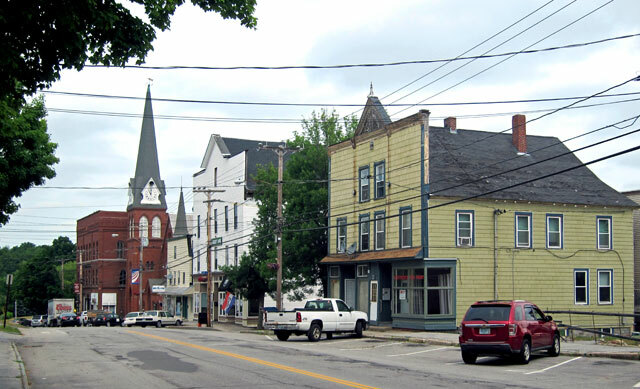 A return more thorough visit is in order, and RAY RECOMMENDS – spend some time exploring Pittsfield, NH. Typical extant home and history plaque. Pittsfield’s impressive Civil War monument. Remember to click on any of the above to see larger images. This time I explored more in Effingham, learned more, and am sharing. 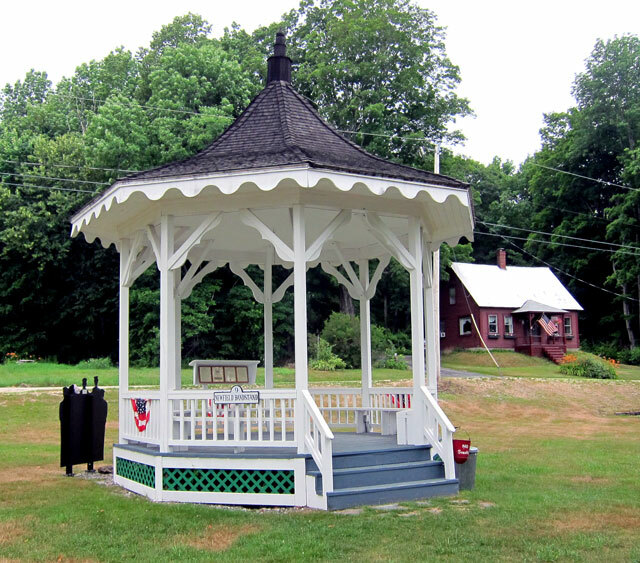 Effingham, NH, Bandstand – A Bandstand as it should be. Virtually untouched, there are 21 colonial era properties in the historic district. Just off Route 153 the First Normal School in New Hampshire, and next door the Lord Mansion, one of the largest period homes I have seen with massive attached barns and carriage sheds. Marker for First Normal School on Route 153. First Normal School on the side road. Back to Route 25 east, crossing into Maine – only to find much of nothing (I had been hoping to score big at antique shops). 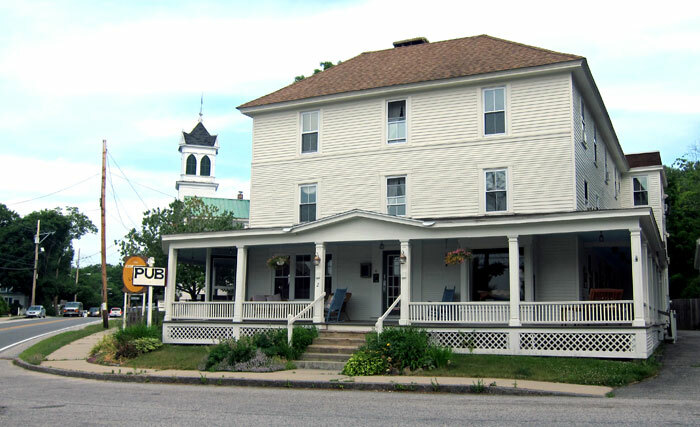 With few lodging choices in the area, I had made a reservation at The Cornish Inn – yes, in Cornish, Maine. Arriving at 3pm, my key and a note had been left on the newell post, so I left my things, and then walked around town looking at some shops – decent ones for a change. The antiques were great, pricey, and anything I would have wanted, I already own. Across the street was this great shop, and the interior had been a country store. Original country store set up. Closing the last shop at 5pm, and since my Inn’s dining room had been closed for the evening (was planning to eat there), I headed further east to see Sebago Lake. I recently saw a Home and Garden TV show searching for homes on the lake and wanted to see it, and there had to be a restaurant on the water. There was not, and I can now say I saw Sebago Lake. 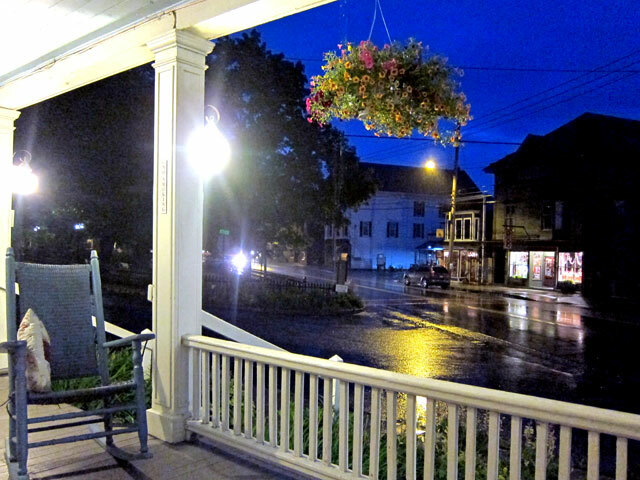 I found a so-so old inn for dinner on the way back to Cornish, and when I returned, I planted myself on the porch to read and write in the rain. 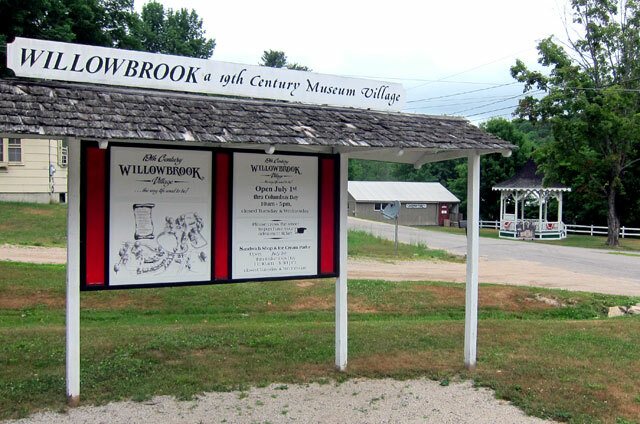 After a nice breakfast at the inn on Friday morning the 8th, I headed for my destination in Newfield – 19th CENTURY WILLOWBROOK VILLAGE. There a few minutes before opening time, I struck up a conversation with a gentleman outside the old country store – now the entrance and gift shop on the left above. Ends up he is the museum director, and between my questions and our similar interests, it was an hour before I got to purchasing my ticket. I had to know the history of why the museum was there (I always have to know why something or a town is where it is). 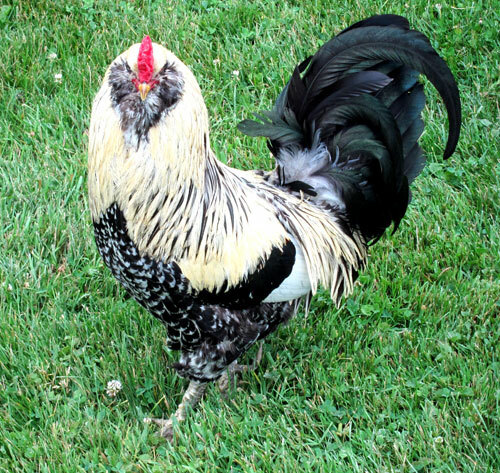 Don King bought the main farm in 1965 for use as a hunting lodge, but then began collecting farm implements and the like to save the items from the dump. He began restoring things, and in May, 1970 decided to open his museum. Most fascinating, I learned that most of Newfield was lost in 1947 – the year that Maine burned. It was suggested that I read WILDFIRE LOOSE by Joyce Butler. I ordered it that night, and when it arrived could not put it down. You have no idea what you will learn about fires, and wonderful neighbors helping neighbors. Having visited the past few years in all the locales mentioned, I could place the action. Extremely well written, RAY RECOMMENDS – get WILDFIRE LOOSE, and devour it. Including time for lunch at their nice sandwich shop, I spent 2 1/2 hours on the grounds once I got started after visiting with the director. Note mechanisms under horses to rock them. Few of these may exist, and this is the most complete outfit in existence, and worth the visit. 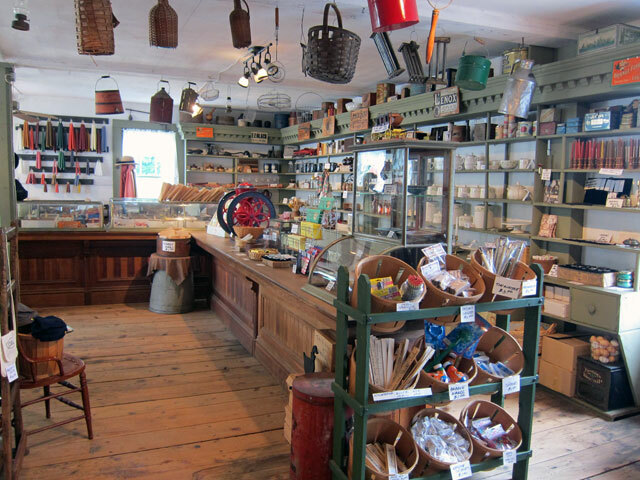 You enter the village in the country store – and you know me and country stores (goodness, I may have never shown you the country store I have recreated in my bookshop – something to share with you someday – a 45 year plus fascination). Upstairs is the original meeting and dance hall, with walls decorated in 1924 in the Rufus Porter style. 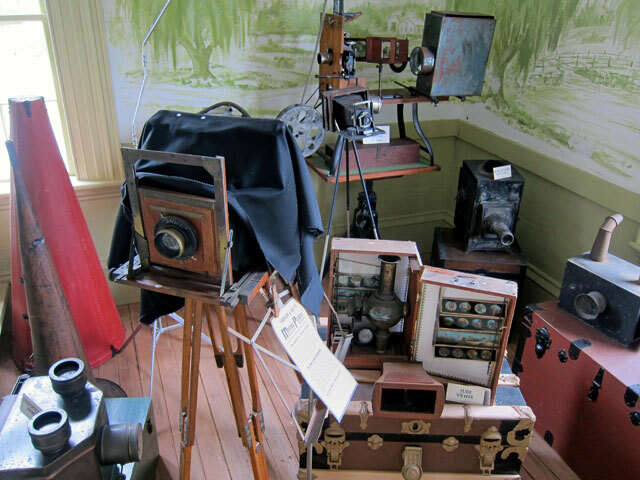 In the front corner was a collection of cameras and projectors. I have examples of half of the ones shown below – yes, another fascination. 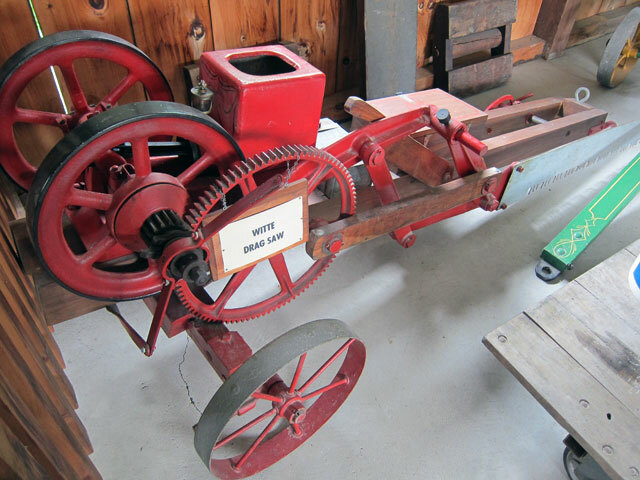 Some wonderful farm related exhibits in the barns connected to the country store. 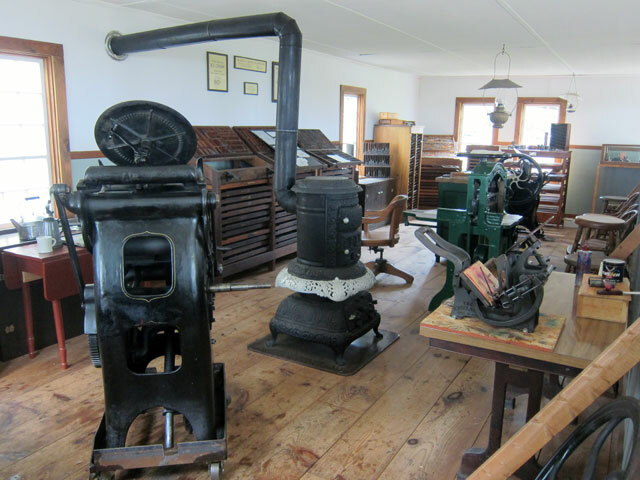 Then you walk down the road (no traffic) to the adjoining area for more exhibits, and the print shop – yes you know another passion. 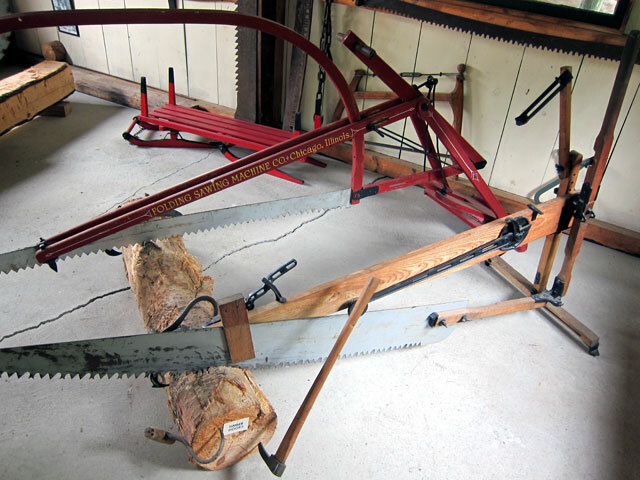 And, I had never seen these large folding one-man saws before, so have to share. And, with all the hit-‘n’miss equipment I have seen in the past couple years, I never saw a saw (no pun intended) attached in this way. And, another “appropriate” band stand. 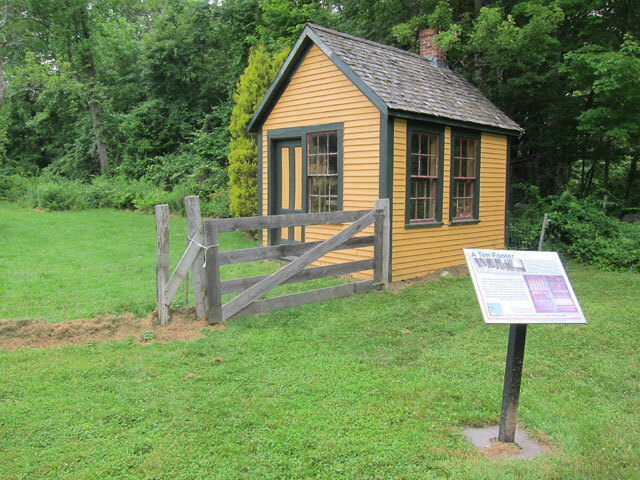 When I was planning my route to Maine, I saw on the map — New Hamspshire Farm Museum, which I knew nothing about. It was on the way home in Milton, so backroading away I went arriving about 2:30. The docent shared with me the win-win situation of the museum’s establishment. The last heir of the farm died, and her will called for destruction of the 18th century complex since she wanted no one else to live there. 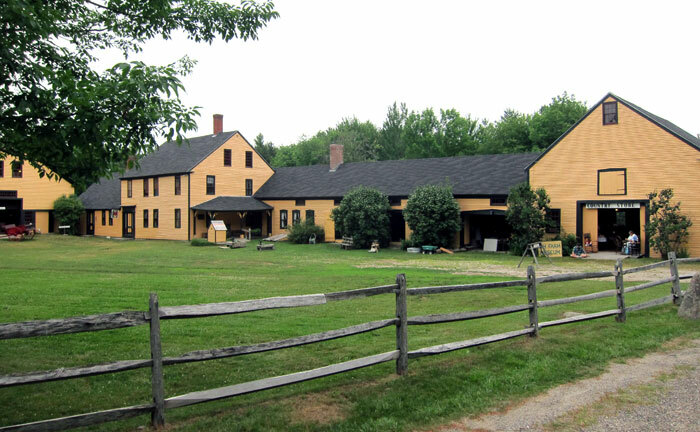 The existing farm museum non-profit had no home, and a NH Court battle broke the will, and the museum bought the property preserving it to tell the story of agriculture and rural life in New Hampshire over three hundred years. 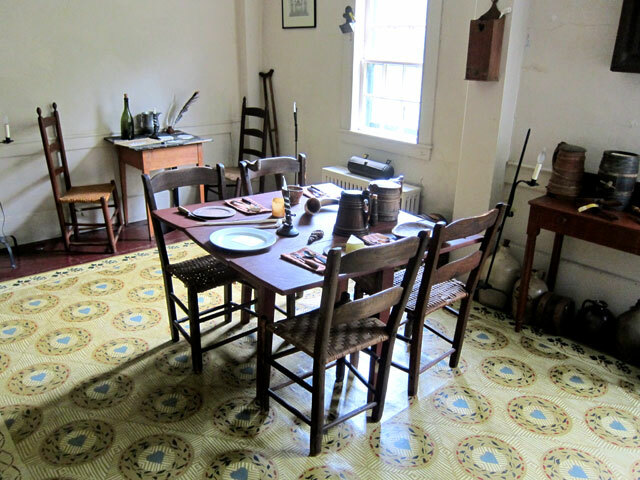 At one time, the home served as a tavern, here refurnished as it would have been used. Note the floor cloth – I am partial to them. 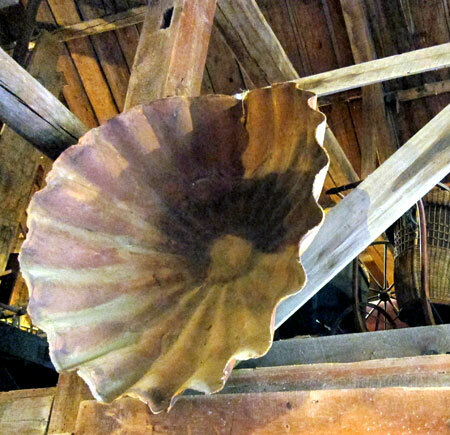 And there are fascinating exhibits in the 104 long, three story barn. So much I had never seen before. And, this ten-foot building led to more research, another book purchase, and I can tell you that these buildings were all over New England serving as “shoe factories.” You go research. This entry was posted in Day (or maybe two) Trips and tagged Cornish, Fire of 1947, Maine, ME, Milton NH, New Hampshire, New Hampshire Farm Museum, Newfield, NH, Pittsfield, The Cornish Inn, Willowbrook Village. Bookmark the permalink. I always enjoy reading and looking at your pictures and all of your shunpiking adventures. 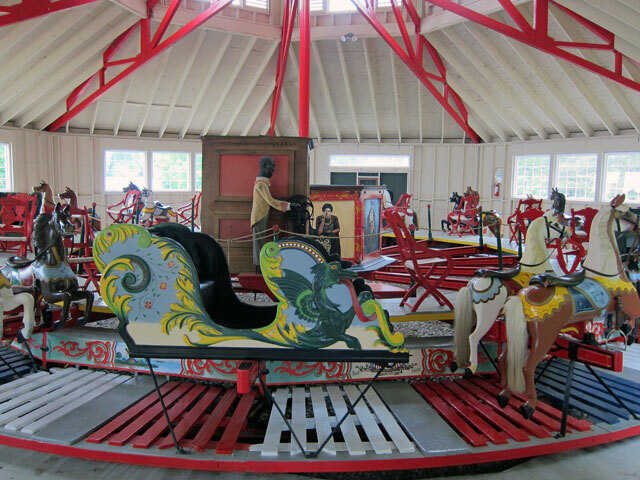 I hope you were riding on the carousel, looks like great fun. Okay, Ray, you hooked me….I guess I’ll have to wait for your next post to figure out what that picture is. As for this post, I looked up Calf Teria and New England Shoe Factories; the “shoe factories” was not as easy a find as I thought it would be. Interesting tidbit on the website I did find that mentioned Abraham Lincoln supporting the shoe workers in their strike. Well, I learn from yours, thank you to you. I only found one article on the Ten Footers, and it was a few pages in one of the books we opened at your house. I NEED TO KNOW, the why of the design, size and window placement — there has to be a reason, but so far has evaded me. Now I am on the hunt for these buildings – guess I need to own one. Did you actually see CALF-TERIA stamped on the pail? Neat. And you will be surprise what the mystery item is — took me awhile to even find their explanation sign.